I have always loved picture books. I loved them as a kid, of course, but then you get to the age where you think picture books are for babies and you want to be seen reading something a little chunkier. And then you go through a Virginia Andrews phase (am I showing my age?) and then you come out the other side and end up reading all kinds of things. And then the circle is completed when you have kids yourself and it's back to picture books again. And it's a joy. It really is so much fun to re-visit your childhood favourites and discover new ones too. But actually, my love of picture books was renewed more than ten years ago, way before I had kids, when I got a job doing the storytime at a library. I did that for three years. What a job! 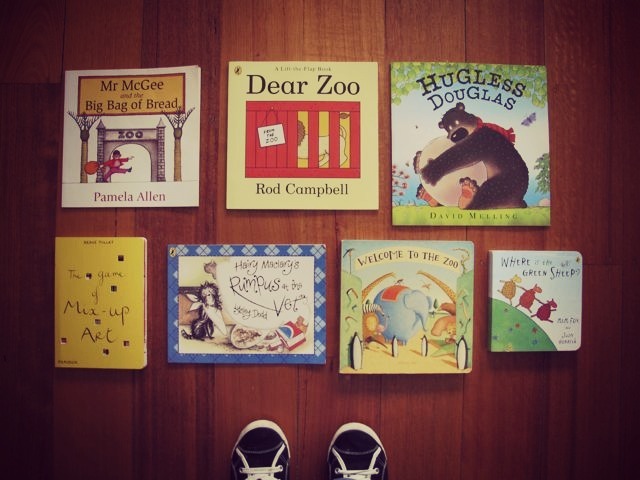 I got to select my favourite books (according to weekly themes) and share them with a group of ants-in-their-pants pre-schoolers whose faces I got to watch during the exciting bits, the funny bits, the scary bits. I loved the way they got so involved in the story. Some of them had to get up and walk over to the book and stand right in front of it. That's how engrossed they were. I loved doing the voices and pacing the stories just right so they got the suspense, or the joke, or the fright. I remember how terrified I was when I was first offered the job. For some reason, when I went for the position, I wasn't entirely sure what I was in for. I was so shy and really quite terrified of public speaking. I don't know why I thought this was the job for me. I think I just wanted to work in a library. I thought it might suit my introverted character. I didn't count on 'performing' on a weekly basis! I think I'd just turned 22. Ugh, so young. Although at the time I thought I was very worldly, having just gotten back from a European adventure. 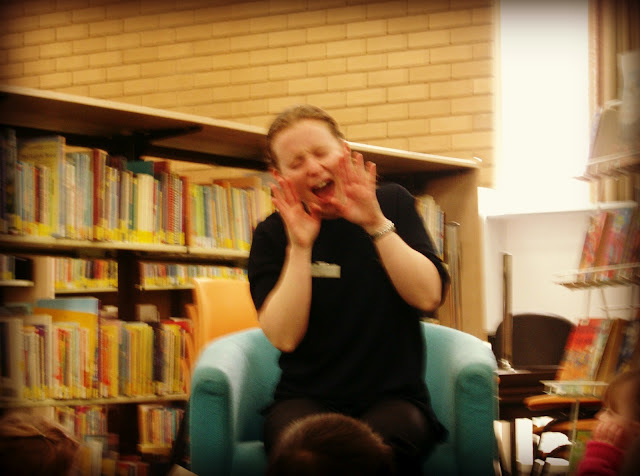 What mortified me the most about the job was that I would have to sing between stories. I would actually have to sing, aloud, in front of other people. Well, I couldn't sing, and I can tell you now, I still can't (as Miss P often tells me) but you know what? I got over it. The kids don't care (apart from mine ;) and they just sing along too: Incy Wincy, Happy and You Know It, Five in the Bed, Wheels on the Bus. Oh yes, I did all standards. In a lot of ways, because of the wide age-range of the kids, the songs were the easiest bit. They all knew them, they could all do the actions and everyone was on the same page. The reading was a little harder because you had to select books that would appeal to the almost-at-school kids but also the 18-month-old attention span. So it ended up being a lot of animal books (who doesn't love to make animal noises? ), pop-up books, and books where there was enough suspense to hold their attention for the surprise at the end. Hehe. It was fun! This was my very favourite book to read (below) because it always got such a great reaction. It was about how a baby bear was scared of a monster in the night and every page threatened to reveal it (I'd tease the kids by telling them I thought we should stop reading the book because it might be too scary for them and they'd shout for me to keep going) but at the end the scary monster noise turned out to be the Daddy bear asleep, snoring. I'm pretty sure this is the final 'reveal' page. I wish I could remember the title and track it down. I'd love to read it to my kids now. A book at the time that really helped me learn techniques for reading to kids was Mem Fox's Reading Magic. I still think it's an awesome book. 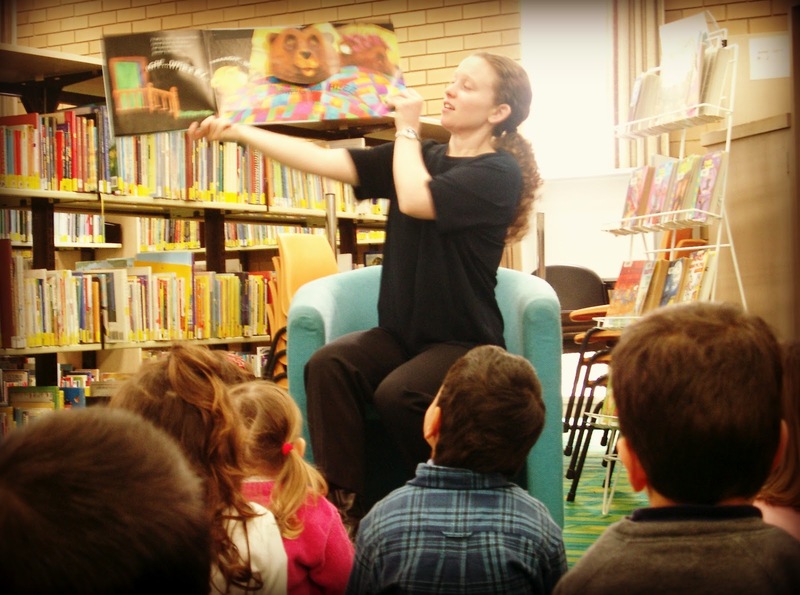 It not only convincingly makes a case for the importance of reading aloud to children, it actually gives real tips and tricks for making it fun. The other book that came along a bit later was Paul Jennings' The Reading Bug, which is also full of great advice. There are probably more around now, I haven't had a look on this topic for a while. A book I did pick up recently on the Readings bargain books table was 1001 Children's Books You Must Read Before You Grow Up. I love it! It's an encyclopaedic listing (organised in age groups) of great books, classics, and some I've never heard of and can't wait to track down at my library. It's a great resource and nice to flick through too because there is a colour image of each book cover. I loved that storytime job but I ended up leaving it for my next adventure: living and working in Japan. But that's another post for another day. Even though I no longer read to kids for a living I read to my own kids every day and I reckon I enjoy it just as much as them. Actually, sometimes more...often I find myself continuing with a story even after P's lost interest and has starting turning the pages of another book!